The WSOP Circuit Harveys Lake Tahoe $1,700 Main Event is drawing to a close with just four players left in contention after Day 2 of the tournament. Stephen Song, a former gold ring winner, is leading the pack of four into the final day of action, which is set to start today at noon local time. It was an action-packed Day 2 at the host casino. There were 54 players to start the day, with those being the survivors from the event’s two starting flights. Michael Hubbard was leading the remaining hopefuls. However, despite his initial advantage, the player eventually busted in 8th place. The remaining contenders were just nine bustouts away from the money bubble when cards were thrown in the air for Day 2 action. Eight of those eliminations occurred quite quickly. However, players played for over 40 minutes before the unfortunate bubble boy was eliminated. And it was Frank Pezzullo who became the last player to leave empty-handed. All in all, this year’s edition of the Main Event at Harveys Lake Tahoe drew 442 entries. They generated a prize pool of $669,630. The money was split into payouts for the top 45 finishers. Min-cashes were worth $3,027. Each of the remaining four survivors is guaranteed at least $49,392 from the prize pool. And the winner will go home with $147,314 and a shiny new ring. As mentioned earlier, it will be Stephen Song who will be leading the group of four players when the final day of action kicks off. The player bagged and tagged 3.88 million last night. It should also be noted that Song captured his first-ever gold ring from the series just a few days ago. He bested the field of the $400 No-Limit Hold’em (1-Day) event at Harveys Lake Tahoe for the gold piece and $13,901 in prize money. Song is followed closely behind by three-time gold ring winner Brett Murray, who scooped 3.8 million in chips last night. Back in September, Murray took down the Main Event of the WSOP Circuit’s Thunder Valley stop. The other two players who made it through Day 2 have, too, previously won gold rings from the series. Scott Sanders, who came into the Main Event fresh off a triumph in the $400 Monster Stack at Harveys Lake Tahoe, will start Day 3 play with 3.525 million in chips. Two-time gold ring winner Nick Pupillo rounds out the final four with a stack of 2.15 million. Day 3 action begins today at noon local time at the host casino. The finalists will play down to a champion. As mentioned above, the winner will go home with a six-figure payout and a gold ring. In addition, he will secure a seat into the season-ending Global Casino Championship, which will be played next summer. 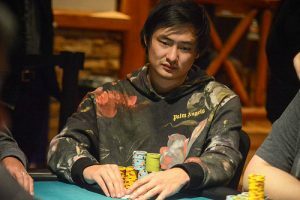 The post Stephen Song Hops Into Final Day of WSOP Circuit Harveys Lake Tahoe Main Event as Chip Leader appeared first on Casino News Daily. The European Court of Justice has ruled that it is up to an Austrian court to determine whether the country’s monopoly system in respect to the provision of gaming services is coherent. The CJEU ruling was issued on September 6, 2018, and was published today in the Official Journal of the European Union. The CJEU issued its order in response to a request for a preliminary ruling from the Landesverwaltungsgericht Oberösterreich. The latter is the referring court in a case dating back from 2012 when Robert Pfleger and other applicants turned to court, asking whether the country’s restrictive gambling regime was in breach of Article 56 of the Treaty on the Functioning of the European Union. Said article prohibits member states from hampering the free movement of services within the union. The legal dispute was initiated after the affected parties had their gambling machines seized by Austrian authorities. According to country officials, the machines, which were found to have been manufactured in the Czech Republic, were operated in Austrian inns and gas stations without the necessary authorization. + the advertising measures undertaken by licensees also seek principally to entice persons who have not previously played games of chance to do so. According to Austrian consultancy firm Kreutzer Fischer & Partner, the country’s gambling market generated revenue of nearly €1.7 billion in 2017. Online gambling accounted for the smallest portion of the whole bundle with total revenue of €283 million. However, it was the fastest growing sector as it recorded an 11% increase year-on-year. There is only one operator to be locally licensed to provide online gambling services in Austria – Casinos Austria’s Win2Day brand. However, Kreutzer Fischer & Partner analysts found that unregulated gambling websites actually accounted for 65% of the country’s online gambling market in 2017. Austria has been heavily criticizes for its current gambling regulatory regime, but instead of liberalizing its market, it has even tried to toughen the existing regulations. Last year, lawmakers were planning to introduce a legislation that would have required local Internet service providers to block unlicensed gambling businesses from targeting Austrian gamblers. A draft bill was introduced this past February, but was later on withdrawn due to technical issues. The post CJEU Leaves It to Austrian Court to Determine Whether Gambling Monopoly System “Is Coherent” appeared first on Casino News Daily. Las Vegas casino giants MGM Resorts International and Caesars Entertainment Corp. are reportedly discussing a merger to create a behemoth company that would control about half of the Las Vegas and Atlantic City gaming and hospitality markets, the New York Post reported citing unnamed sources familiar with the ongoing talks. According to NY Post sources, MGM has tapped investment bank Morgan Stanley and law firm Weil, Gotshal & Manges to study a potential merger with Caesars. However, there is still no offer on the table, sources have pointed out. People familiar with the matter have also revealed that activist hedge funds, which collectively own about a quarter of Caesars, have been pushing for a MGM tie-up for some time now. A merger of the two operators would create a behemoth gambling giant with a market capitalization of more than $21 billion. According to the NY Post’s sources, Canyon Partners, which owns shares in both Caesars and MGM, is among the hedge funds supporting a deal between the two companies. It is also important to note that in the case of a merger, MGM and Caesars will together own about a half of all Las Vegas and Atlantic City hotel rooms, which could result in competition authorities raising concerns over the impact of a potential tie-up. During its Q3 financial results conference last week, Caesars announced that its CEO and President, Mark Frissora, would step down in February 2019 after three years at the operator’s helm. According to the NY Post, Mr. Frissora was actually dethroned because he was largely opposed to the company’s sale and his opinion on the matter was clashing with that of investors. Sources believe that Apollo Global Management, which together with TPG Global are currently Caesars’ largest shareholders, supports a sale. In addition, reports emerged not long ago that hedge fund HG Vora Capital Management has quietly built a nearly 5% stake in the Las Vegas casino giant and has been trying to persuade it to consider divestiture of assets or an outright sale. According to the NY Post, Caesars might be having other suitors besides MGM. Sources believe that Wynn Resorts and Malaysia’s Genting Group could, too, be interested in a tie-up with the Las Vegas gambling giant. Private equity firms that hold licenses to operate casino might, too, be in the mix, according to sources. The Blackstone Group, which purchased Spanish gambling company Cirsa earlier this year, was mentioned as one such private equity firm that might be eying Caesars. The post Las Vegas Casino Giants MGM and Caesars Reportedly in Merger Talks appeared first on Casino News Daily. Poker could soon become legal in Israel, if a bill proposing the legalization of the game gains enough traction in the Knesset, the country’s legislature. The bill was introduced shortly after the nation’s Supreme Court ruled that poker was a game that required skill and its outcome was not entirely based on luck. Poker has long been illegal in Israel. Prior to the Supreme Court ruling, people caught playing the game faced up to one year in prison, while those organizing poker tournaments faced sentences of up to three years in prison. In his recent ruling, presiding Supreme Court Judge Neal Hendel has said that poker is clearly a game of skill and “the fact that players go to contests and tournaments year after year strengthens” the notion that it is namely skill and not luck the outcome of the game depends on. Following the Supreme Court ruling, Sharren Haskel, a member of Israel’s Likud party, has introduced a bill calling for the legalization of poker on the territory of the country. Under the bill, the game will be treated as one of skill, reflecting the definition it has been given by the country’s highest ranking court. In addition, the bill provides for the organization of poker tournaments in Israel, including international ones. As mentioned earlier, the organization of such events is prohibited under current laws. The newly introduced bill also contains provisions for the regulation of the Israeli Poker Players Association. The association will be tasked with the organization of both national and international tournaments. Israel’s Finance Ministry will be the body to regulate and oversee the game of poker. It will also collect tax earnings from the organization of poker tournaments on the territory of the country. Commenting on his piece of legislation, Mr. Haskel has said that “Israeli sportsmen bring respect and pride to the state in international competitions” and now as poker is treated as a sport by the Supreme Court and not as a game of luck or a form of gambling, poker players “should be permitted to practice on their home turf.” Mr. Haskel’s bill has been tabled for consideration by the Knesset and it is to be seen whether it will gain enough support. While Israeli lawmakers’ stance toward poker might be softening, they are still firm on their determination to crack down on the provision of illegal gambling services in the country. And it should be noted that gambling, with very few exceptions, is prohibited in Israel. News emerged last month that a Tel Aviv District Court has ordered that three gambling websites targeting Israeli players be blocked. The ruling was based on a 2017 law that allowed Israeli District Courts to block access to unauthorized gambling operations. Russian bookmaker 1xBet as well as P2V and Totobet777 were the three gambling websites that fell victims to the Tel Aviv District Court’s crackdown. The post Poker Could Soon Become Legal in Israel under New Bill appeared first on Casino News Daily.